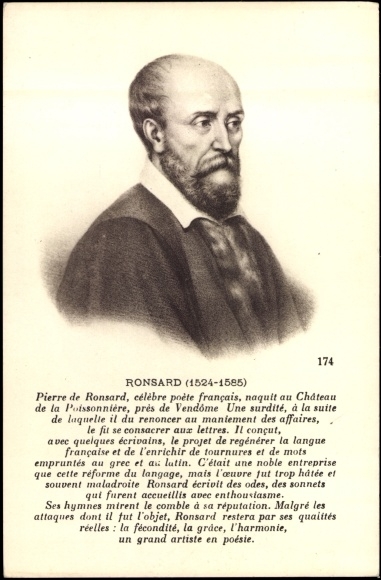 As proposed, here is Jacques Peletier’s response to Ronsard’s ode dedicated to him. It replicates Ronsard’s stanzas, rhyme-scheme, etc. I was reading Peletier to find out about his proposed spelling reforms andideas for a new orthography of French, with lots of different diacritical marks differentiating different ‘e’ sounds etc (think of English – ee-normous, en-normous, in-normous, even a-normous). Though I’ve normalised his e’s, I’ve left some of his other idiosyncratic spelling (-z endings for instance) in the text below. While Ronsard must have had a smile on his face while describing the ideal (and unattainable) mistress, I imagine Peletier had a broad grin on his face as he described her ideal lover – who’s rather unlike Ronsard in many respects! A un Amy aussi gentil comme elle. Un tel present, y eust il du defaut. Le seul moyen toutes choses compasse. Membres nerveux, bien charnuz et massifz. Jambe videe, et mesuree allure. Trop grande joye est trop tost abolie. Cueur de mesure en corps bien mesuré. Combien ailleurs habile il pourroit estre. D’un bon accord, gardant mesure et temps. De ce qui est a elle seule acquis. Que quleque fois elle l’ait fait cocu. To a lover as noble as herself. Such a man if he were here, even if by default. Only the man of average height compasses all things. Lively limbs, well-fleshed and massive. A well-set leg and a measured gait. Too great a joy is too quickly gone. he warms everyone’s hearts with its sweet power. A moderate heart in a well-moderated body. In good harmony, keeping rhythm and time. With the man that she alone has won.